Crowd-funding platform Indiegogo’s recently highlighted the GoBe wearable sensor, an activity tracker with an alluring twist: “GoBe is the first and only wearable device that automatically measures the calories you consume and burn all day.” With a $199 price tag and projected shipping date of June 2014, the campaign has blown through its initial goal of $100,000 by raising over $800k as of this article’s publishing. It also features a well-designed product page, touting an experienced development team that has a history of working with major corporations such as Motorola, Reebok, and L’Oreal. However, not surprisingly, the GoBe’s promise of passive nutrition tracking has raised significant skepticism over the accuracy and reliability of such a device, and has raised questions over the responsibility of crowd-funding sites when promoting these campaigns. 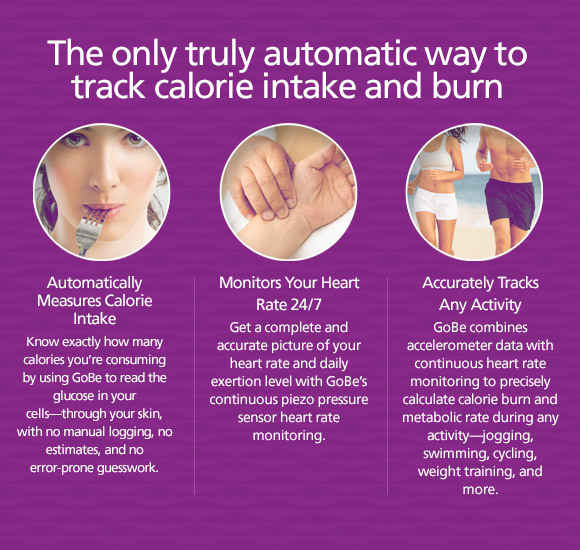 Put simply, the significance of automatically calculating calories consumed and burned cannot be overstated. Currently, calorie databases such as MyFitnessPal require manual input, and prove laborious when calculating home-cooked meals or more exotic cuisines. While the utility of food-logging with weight loss has been supported by medical literature, it requires sustained discipline. 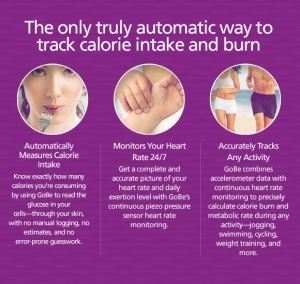 The ability to record calorie intake automatically would allow users to instantly have an idea of their net calorie status, indicating whether they are progressing towards weight gain or weight loss. Unfortunately, the promise of passive nutrition tracking sounds too good to be true. In Fall 2013, Airo Health, a startup of recent college graduates began taking pre-orders for their wristband which promised to use spectroscopy to automatically calculate caloric intake. Their claims were met with widespread skepticism, and later AIRO refunded their pre-orders, promising to re-open pre-orders when their sensor had undergone further testing and calibration. Their Twitter site has been inactive since that time, and their website has not been updated in the interim. With Healbe, the company behind the GoBe, the pedigree of its employees lend a modicum of credibility. On their information page, Artem Shipitsin (CEO) is touted as playing a role in developing market solutions and new products for established brands such as Reebok and L’Oreal. Michael Rubin, presumably in charge of technology, is listed as a chief researcher of algorithm, a subsidiary of GEN3 Partners, which owns patents in medical space and has partnered with medical device companies in the past. However, the absence of any clear medical professionals associated with the device is concerning. Furthermore, the website is sparse on details and images of the device that provide clear evidence supporting the legitimacy of such a device. All the images on the campaign site and their website lack any angles showing the actual sensors on the back of the device. While a brief glimpse of the back can be seen in the video at 0:40, the sensor appears unlike any other I’ve seen. The GoBe utilizes patented Healbe FLOW technology, which measures calorie intake through your skin – by reading the glucose in your cells, and utilizing a combination of information from a pressure sensor, impedance sensor, and accelerometer. In an e-mail correspondence, CEO Artem Shipitsin explained that the first iteration will not measure specific nutrients (other than glucose and calories) by explaining that the sensors have not reached their satisfaction when detecting carbohydrates, protein, and fat. He also explained that the system has only been validated internally, and that they plan on submitting the device for external validation in the second half of May. In an e-mail to Mobihealthnews, CEO Shipitsin said that the company has tested GoBe’s glucose sensing against a traditional glucose meter’s readings and the GoBe’s level of accuracy usually falls within the 80 percent to 85 percent range, with caloric accuracy falling in the 88-92 percent accuracy range. As an endocrinology fellow, transcutaneous glucose sensing has long been the holy grail as patients would much rather not prick their fingers. However, I can’t help but be skeptical until a reliable sensor reaches market. Several previous companies (such as C8 Medisensors) have tried and ultimately failed to bring such a device to market. While not impossible, it’s difficult to take seriously a crowd-funding campaign asking for money upfront for an unreleased product by a company with no track record. More troubling, Indiegogo allows for flexible funding campaigns, which delivers your money to the project owners at the time of initial pledge, even if the campaign does not meet its goal. While the GoBe project far surpassed its goal, all initial investors would have been out of their money even if the project did not reach resolution. As such, all $630k that has been contributed to GoBe is non-refundable at this time, and users are not able to re-gather their money unless the project owner permits. This contrasts from Kickstarter, which allows their campaign funders to modify or withdraw their contribution up until the project’s deadline passes. Should crowdfunding sites share any responsibility for failed campaigns? On one hand, it’s understandable that crowd-funding campaigns can’t be held responsible for every single campaign on their site. Users are responsible to use their reasonable judgment before contributing funds. However, it’s another thing entirely when Indiegogo prominently features a campaign in their e-mail campaign (presumably) sent to all their users, as they did for the GoBe in an e-mail sent out on 3/11/2014. By doing so, they project a vote of confidence in the project, and this could partly be responsible for the immense success of the GoBe. If the project turns sour or fails to meet expectations, Indiegogo should learn from this and exercise more discretion in future emails. Once again, the GoBe’s promises of passive nutrition tracking by June 2014 can’t be 100% disregarded as false, especially three months in advance of any release date. If anything, I am cautiously optimistic for such a device, and perhaps similar technology will soon be available in wearable devices from Apple and Google. However, due to my skepticism outlined above, the GoBe will not be the 45th project that I crowd-fund, and I would encourage iMedicalApps users to exercise extreme caution when investing in the GoBe or any other crowd-funded project that sounds too good to be true. Nice write up Dr Ahn. Really, anyone who studied metabolism knows that caloric intake is not perfectly proportional to blood (or “cell”) glucose. I’m no expert, but really, it’s extremely fishy. Ultimately, IMO, this thing is a joke. I’m curious to see if it will be the tipping point for wearables / FDA oversight and for the crowdfunding sites — this will be exciting. Wow — I didn’t even think that the FDA or other regulatory agencies would need to get involved, but you make a ridiculously interesting point. When it comes to seeing a product displayed, such as a hardware product, I think the knowledge gap is less, and people can make an educated decision on whether or not to fund the project. But when it comes to science / medical products, the knowledge gap is far wider. The success or failure of this project will be a game changer either way. The FDA’s role is very complex. I anticipate that this will fall into the world of “wellness” and nutritional supplements. I forgot who I spoke with, but even the more legitimate consumer wearables companies do not want to have anything to do with the FDA at this point. Iltifat, great point about the hardware/medical knowledge gap. Even as MD’s, it’s tough to know what is exactly doable and what is not.